“R.I.P.” Tombstone. The eyes light up on this gruesome skull as he guards a decaying tombstone! This tombstone with a faux stone finish has a recessed “R.I.P.” epitaph. 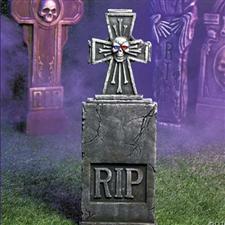 Create your own spooky cemetery by propping this tombstone outdoors on your lawn or porch or indoors against a wall. This realistic-looking grave marker adds a ghoulish look to your Halloween decorations! Foam. 35" Batteries included.